Are you looking to build a new deck, or do you simply want to ensure that your current deck is safe and code compliant? Whatever your decking needs, our Deck Center has the solutions. From finding the right products to navigating building codes, our resources can help make the process easier and make your deck safer. Find the inspiration to build your own outdoor oasis. We've assembled a collection of some of our favorite decks complete with how-to guides. Check out our Ultimate Guide to Building a Safe, Strong Deck for information on products and designs. Add beauty and strength to your outdoor living structures with Outdoor Accents decorative hardware. Now that you're found your inspiration, it's time to plan. These resources can help you design your deck, select products and find step-by-step instructions. With this free web-based software, you can design your deck, print out your permit submittal pages and materials lists, and go. This guide offers step-by-step instruction on using connectors and fasteners to build safe, code-compliant decks. Check out our videos, online and in-person training, literature and industry tips for deck construction. Whether you're building a deck or have an existing deck, you should know how to evaluate its construction to make sure it's structurally sound and safe. Using the proper structural connectors and fasteners, as well as regular maintenance, are the keys to a safe, strong deck. 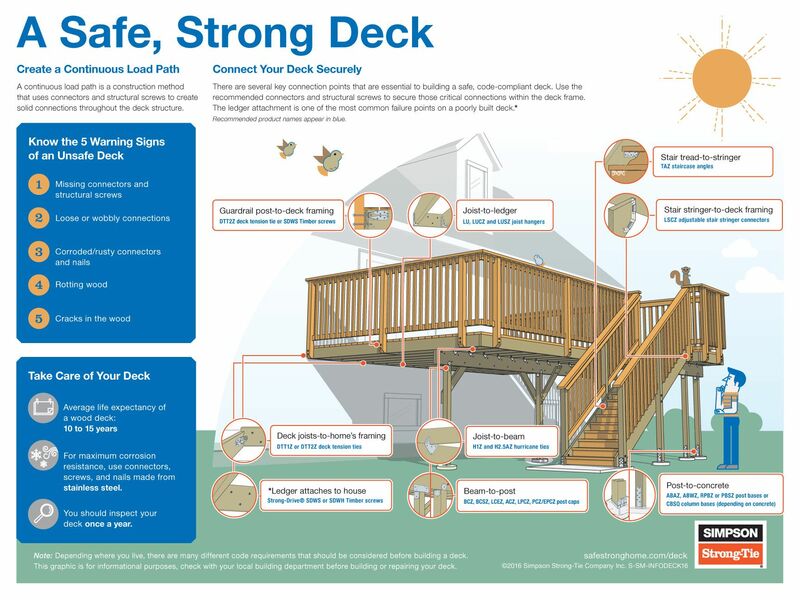 Learn the five warning signs of an unsafe deck and how to determine if you need to repair, retrofit or rebuild your deck. Deck collapse is a serious problem, but one that's preventable. Simpson Strong-Tie teamed up with the Home Safety Council to educate families about the importance of deck safety and inspecting your deck once a year. Meri-K Appy, president of the Home Safety Council, walks you through the five warning signs of an unsafe deck and shows you what a safe deck should look like. The Home Safety Council is a nonprofit organization dedicated to preventing injuries in and around the home. See how to connect your deck securely with connectors and structural fasteners to create a continuous load path.